The FDP fiber optic dip probe is fully immersible, allowing for real-time kinetic data to be collected. 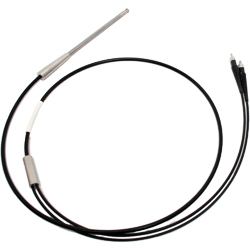 The design of a fiber optic dip probe is very similar to that of a reflection probe, though special effort is taken to guarantee that it is liquid tight and inert. The key functional difference is the presence of a cavity which fills with the liquid sample. This cavity reflects light back through the sample and into the collection optical fiber in a setup commonly referred to as a transflectance. The material of the probe shaft includes 3 parts. The tube is made of stainless steel 316L SS, the window for the lens and mirror is made of silica, and the seal material is epoxy. The table below gives a summary for the chemical resistance for these materials.